When is the right time to start thinking about future care? Though this thought may not be at the top of your to-do list, the answer is right now! The U.S. Census Bureau estimates that by 2050, 21.5% of the United States population will be over 65. By the year 2025, $260 billion will be spent on long-term care for the elderly (up from $102 billion in 2000). Many people are unaware that Medicare does not cover most long-term care services. Planning ahead allows greater dignity, control, and independence over how future needs are met. This type of planning starts with looking into what the cost will be if care is needed from in-home assistance to nursing home or assisted living care. Also, talking with a spouse, adult children, friends, and siblings about whether they would want to or be able to provide care if one of the group becomes ill or disabled for a long period of time should be included in long-term care planning. 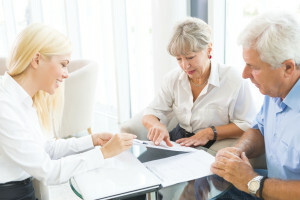 Planning for long-term care needs should also include a visit with a financial planner, insurance agent, attorney, or other financial advisor about how long-term care could be funded. A detailed review of current health care insurance is required to understand whether current coverage pays for any nursing home or in-home care. If needed, one needs to set aside funds to pay for long-term care in a way that prevents these funds from being used for anything else. Long-term care insurance is also an option to consider. There are Veterans’ pension funds available to those who served in war time. Home owners with accumulated assets in the home may want to look at reverse mortgage options. Identify what types of care services may be needed. Sit down with family members and physicians and/or an in-home care manager and discuss the potential risks for needing long-term care someday based on medical and family history, lifestyle, etc. Compare and understand long-term care insurance options. Learn what is offered in the community. Make necessary home improvements if you plan to continue to live at home. Although creating a long-term care plan can seem overwhelming, Hired Hands Homecare of California can help! If you are in the Marin, Sonoma, Napa or Tri-Valley areas and would like to learn more about planning to age in place for you or your loved one, contact Hired Hands Homecare today!